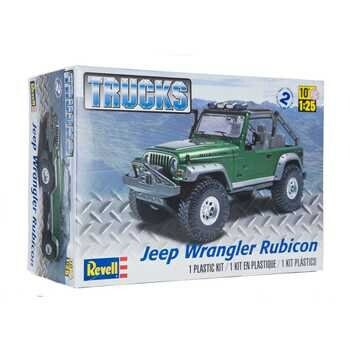 Cross boundaries with this Jeep Wrangler Rubicon Model Kit. One of the most impressive all-terrain vehicles on the market, it is four-wheel-drive, has powerful Dana 44 axles, and comes with a choice of exceptional four and six cylinder engines. These Jeeps are modeled off the WWII workhorse; they have kept the same aggressive all-terrain capability, good handling and titanic towing capacity as their predecessors. This kit features a roll over bar with detail lights, working spring suspension and large off-road tires.